Rusty crayfish are large, aggressive crayfish native to the Ohio River Basin in the United States. 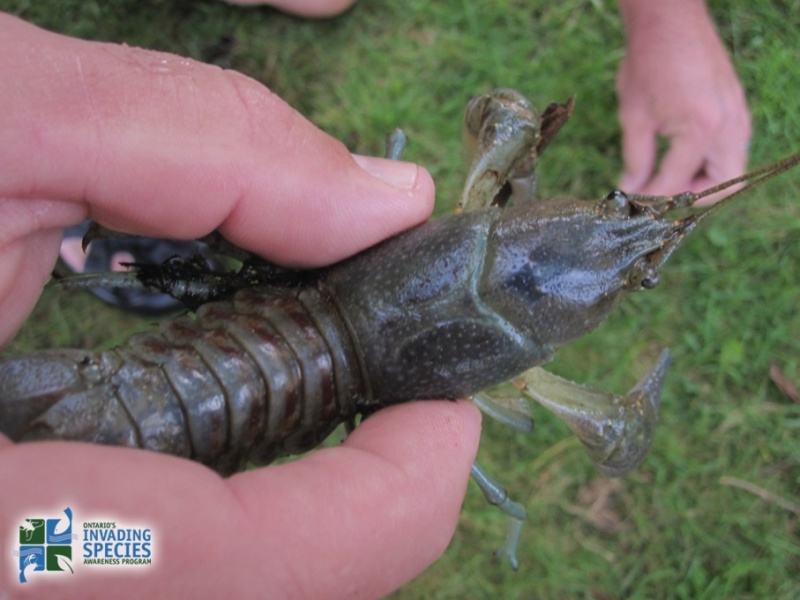 The species was likely introduced to Ontario by anglers from other areas discarding crayfish they were using as bait. Rusty crayfish may also have been put in lakes or rivers by people who acquired them as pets or through the scientific supply trade. 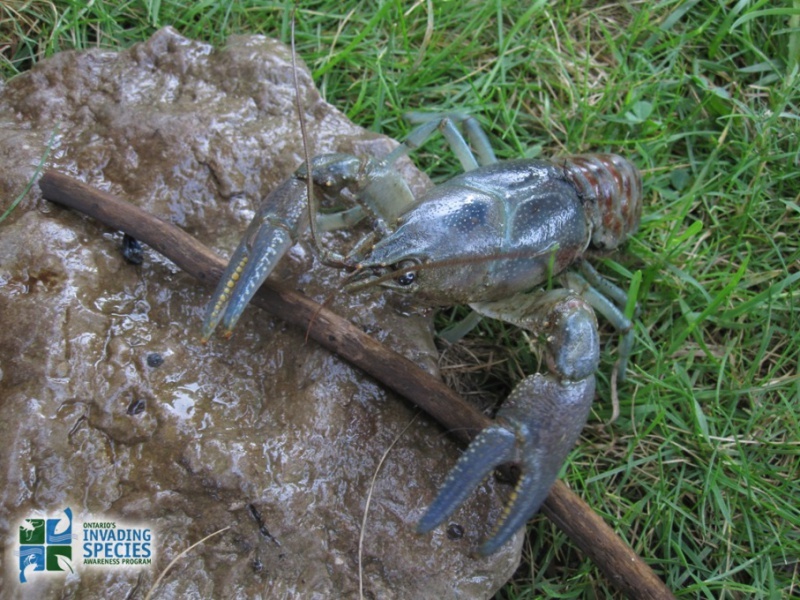 Rusty crayfish are commonly found in lakes, rivers, ponds and streams with clay, silt and gravel bottoms that contain rocks, logs or debris the crayfish can hide under. They eat large amounts of aquatic vegetation and their aggressive nature helps protect them from being eaten by native fish. Females can carry up to 200 fertilized eggs under their tails, enabling a single female introduced to a new area to start a new population. Once rusty crayfish are established, there is currently no practical way to permanently remove them. 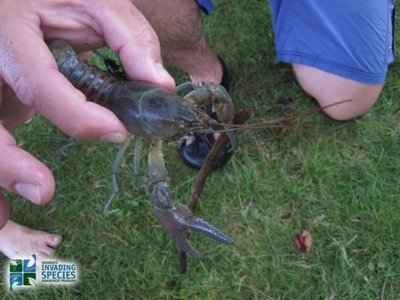 The first Ontario sighting of rusty crayfish was in the early 1960s in the Kawartha Lakes region. They are now found throughout much of south-central and southeastern Ontario, including Manitoulin Island, the Magnetawan River, the Kawartha Lakes Basin and the Ottawa River Basin, and in northwestern Ontario. Outside their native range in the Ohio River Basin, rusty crayfish have also spread to the midwestern and northeastern United States. Click here for the Early Detection & Distribution Mapping System (EDDMapS) to view and contribute to Rusty Crayfish sightings in Ontario. The rusty crayfish's large size, aggressive eating habits and rapid spread have had serious impacts on native species. Rusty crayfish compete with native crayfish for food and resources, often causing the decline or disappearance of native crayfish. They are better able to avoid being eaten by fish than native crayfish, increasing the likelihood that native species will decline. By eating large quantities of aquatic vegetation, they reduce spawning and nursery habitat for native fish. Female crayfish have the ability to carry fertilized eggs under their tail; this feature has allowed the rusty crayfish to spread rapidly. To prevent the spread of rusty crayfish, Ontario prohibits the overland transport of all species of crayfish, both alive and dead. 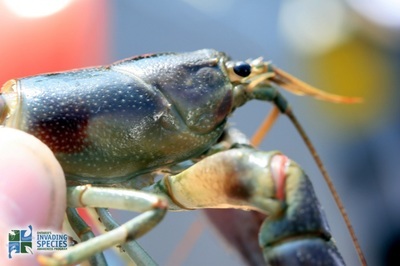 Crayfish can only be used for bait in the waterbody in which they are caught. Rusty crayfish are large; adults can reach 7.5 to 13 centimetres rostrum (partof shell in front of eyes) to tail. Rusty patches on each side of the shell. Grayish-green to reddish-brown claws with black bands near the tips. Claws have an oval gap when closed. The rostrum, is smooth, pinched and distinctly concave. Rusty crayfish may be confused with species of crayfish that are found in Ontario, including the native northern clearwater crayfish (O. propinquus), the native virile crayfish (O. virilis), and the introduced obscure crayfish (O. obscurus). None of these species have a pinched rostrum, black claw bands, or rusty patches on the shell. Learn how to identify rusty crayfish and how to prevent accidentally spreading this invasive species. If you want to use crayfish as bait, you may only use them in the waterbody in which they were caught. It is illegal to transport them over land. The maximum number of live crayfish you can have in your possession at one time is 36. If you have any information about the illegal importation, distribution or sale of rusty crayfish, report it immediately to the Ministry of Natural Resources TIPS line at 1-877-TIPS-MNR (847-7667) toll-free any time, or contact your local Ministry of Natural Resources office(ontario.ca/mnroffices) during regular business hours. You can also call Crime Stoppers anonymously at 1-800-222-TIPS (8477). 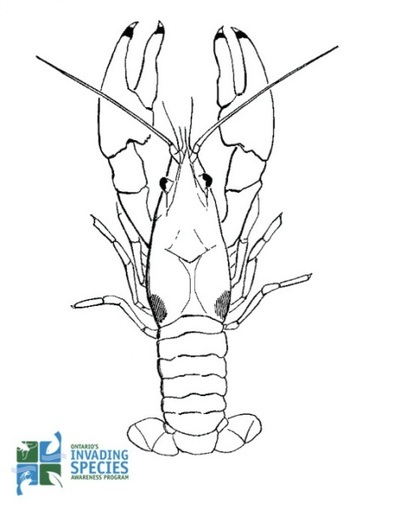 If you find a rusty crayfish or other invasive species in the wild, please contact the toll-free Invading Species Hotline at 1-800-563-7711, or report a sighting online. OFAH/OMNR Invading Species Awareness Program. (2012). Rusty Crayfish. Retrieved from:http://www.invadingspecies.com. This factsheet may be reproduced for non-commercial purposes.